Weight loss surgery is sometimes the only hope for some people. But several health insurances don’t exactly cover their costs, and affordable weight loss surgery is not something you can easily get in developed nations. In the UK, for example, NHS and obesity surgery don’t go hand in hand – the NHS only handles less than half of the cases. There are times when your only hope is getting weight loss surgery abroad where the procedure is cheaper, but the quality just as good!According to the Centers for Disease Control and Prevention, 33.8% of adults in the United States are obese. That means 33.8% of all adult Americans have a body mass index (BMI) of more than 30. With obesity comes a range of health complications that increases one’s morbidity. Unfortunately for some people, dieting doesn’t help any, and exercise presents risks. There are many types of weight loss surgery available abroad. It’s up to you to consult your doctor on which one would work best for you if you decide to go through a procedure. One of the types is laparoscopic weight loss surgery, which is less invasive than some other procedures. For this procedure, a surgeon only makes 4 to 6 incisions on your belly and doesn’t open it up completely. Lap band risks are always there, but so are the risks for everything else. If you decide to go for laparoscopic gastric banding, you have that option, too. Among all the bariatric weight loss surgery procedures though, the National Association for Weight Loss Surgery considers Roux-en-Y gastric bypass as gold standard of procedures. The lower cost of weight loss surgery is the biggest advantage of getting weight loss surgery abroad. Even if your insurance doesn’t cover the costs associated with the surgery, you might be able to afford it just fine compared to getting weight loss surgery in your home country. The exact cost of weight loss surgery you’d have to pay depends on the procedure you choose. The doctor and hospital you go to contribute to the expenses, as well. If you find out everything you can about your options, do your research, and maybe ask Medical Trip for a quote and advice, you could get the best option available to you. 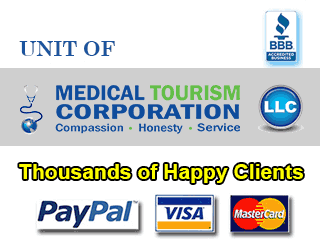 Medical-Trip can also arrange for financing your weight loss surgery. Of course, if you want to holiday soon after your weight loss surgery, you can explore the many tourist destinations of the country you chose. You have to set aside money for sight-seeing. But as getting weight loss surgery abroad is quite affordable, you just might have the financial bandwidth for that. Just like getting weight loss surgery abroad has its pros, it has its cons too. One thing you should remember is that if you’re getting an invasive gastric bypass weight loss surgery procedure, you have to spend time recovering. This means staying in another country with strangers for quite some time. Of course, you can always bring someone with you, but that will cost you more. If any complications arise, the surgeon who performed the procedure on you will not be able to fix things. Always consider the possibility of complications, and find a doctor you can trust in your home country, too. It’s not too late or too expensive to try and shed all that extra weight that’s been giving you one hell of a time. Who knows? You just might find an affordable weight loss surgery option abroad that can help you feel better.